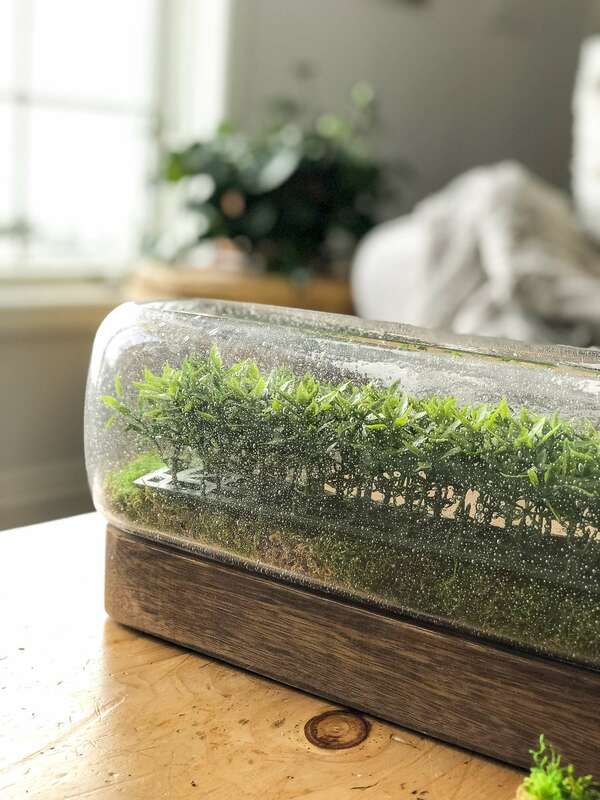 Do you love the look of terrariums but don’t want to maintain them? 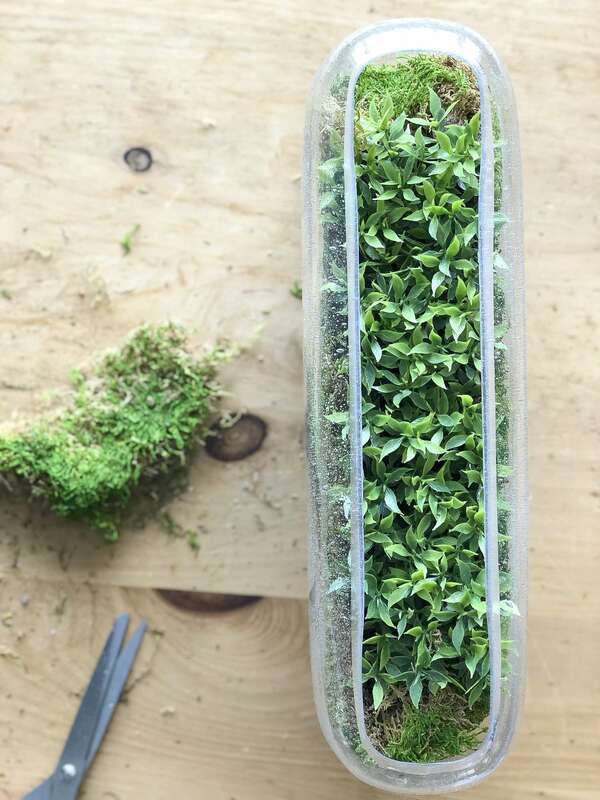 Try out this simple DIY faux terrarium! 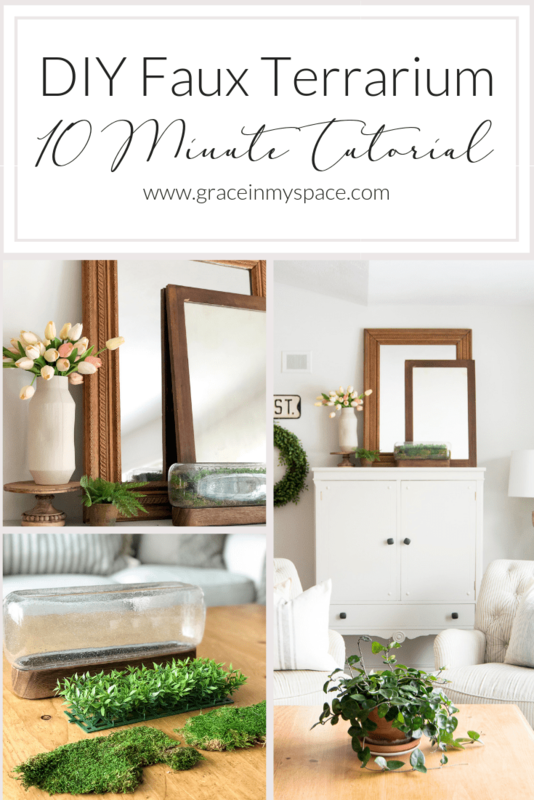 With this easy tutorial you’ll be able to brighten your home in less than 10 minutes. This post may contain affiliate links where I earn a small commission on your purchases at no additional cost to you. I’ve long admired the fresh look that terrariums offer, but have been hesitant to try to keep one alive! They say that they are the easiest, but I’ve killed many succulents in my day. So when I found this clearanced candle holder and an Instagram follower suggested that it would look nice as a terrarium an idea popped into my head! 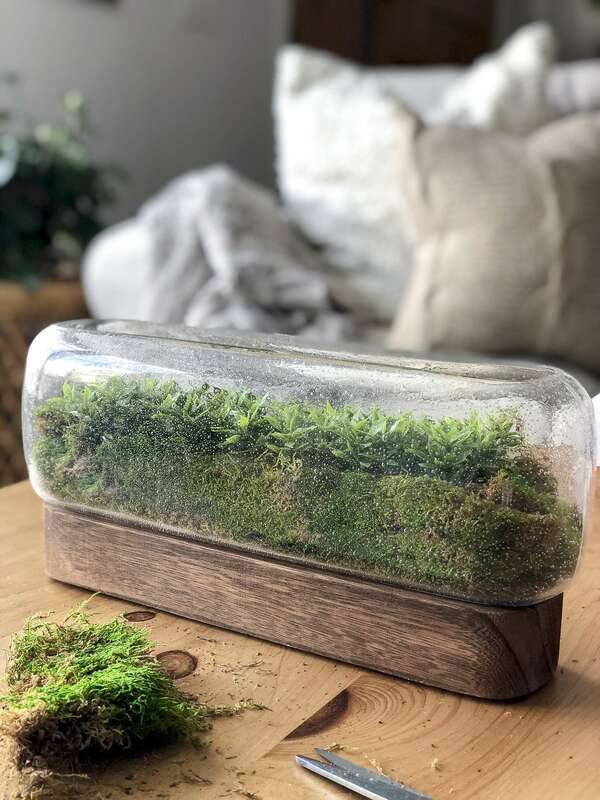 I probably couldn’t maintain a live terrarium, but a faux terrarium would be easy enough to create! Plus, once the spring and summer months are over I can easily convert the vessel back into a candle holder for fall and winter. 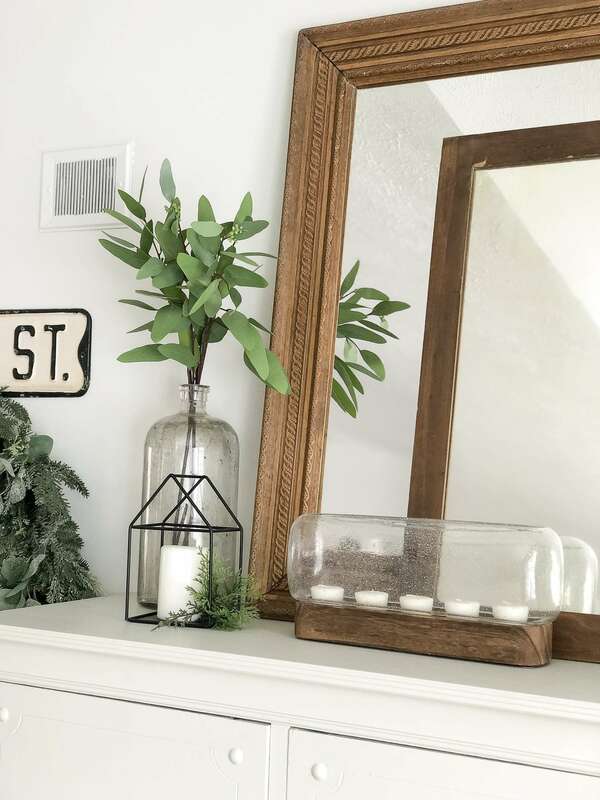 Start by selecting a vessel to hold your faux terrarium. Honestly, since you don’t have to worry about keeping plants alive inside, the vessel can be any shape or size as long as there is glass to see inside! Below are some pretty options you can shop online. The next step is to select your greenery. Many people use succulents in terrariums, however I prefer something less desert like. The beauty is that you can add whatever you wish! 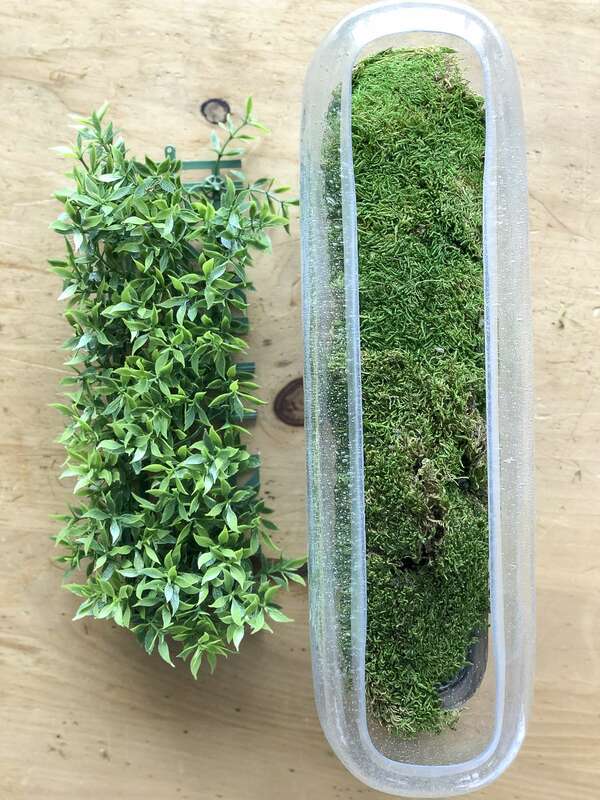 I used this moss and a floral mat cut to size. Next, decide whether or not you want your foundation to be rocks or simply use the greens. Most terrariums have rocks or soil as the foundation, but I just chose to keep it simple by placing the moss as my foundation. 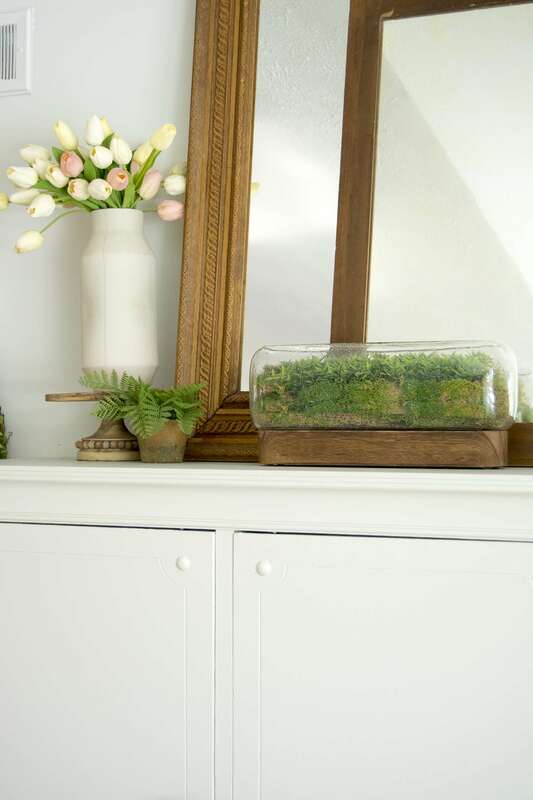 After you’ve decided what foundation you want for your faux terrarium, add the greenery you’ve chosen. I like using these floral mats because you can cut them to size, they greens stay in place, and whatever you don’t use for one project can be set aside for future use! 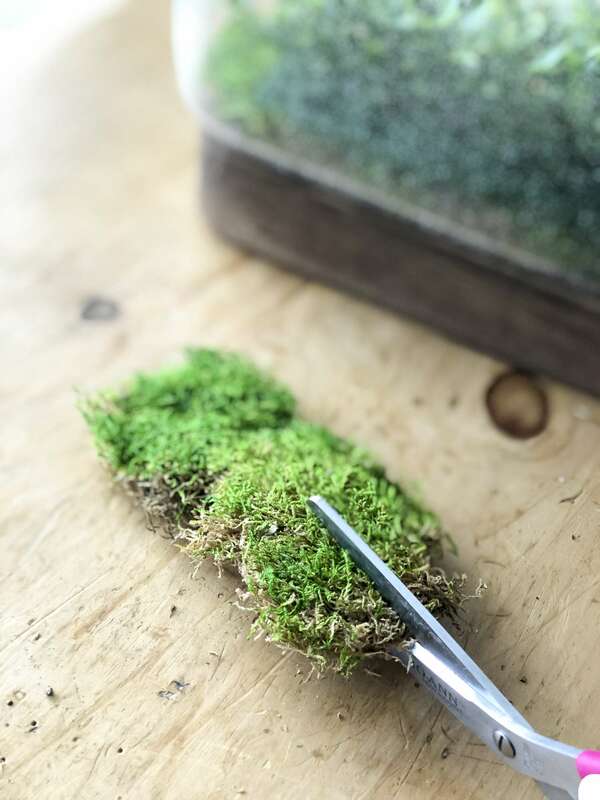 Next, continue to place moss around the base of your floral mat to cover up the plastic. I cut my moss to size and then pulled it apart slightly to help it look more natural. And that’s it! This is such a simple project and would be so fun to do with kids. They could pick out the type of greens they want and make their own creation without all the maintenance of a live terrarium. 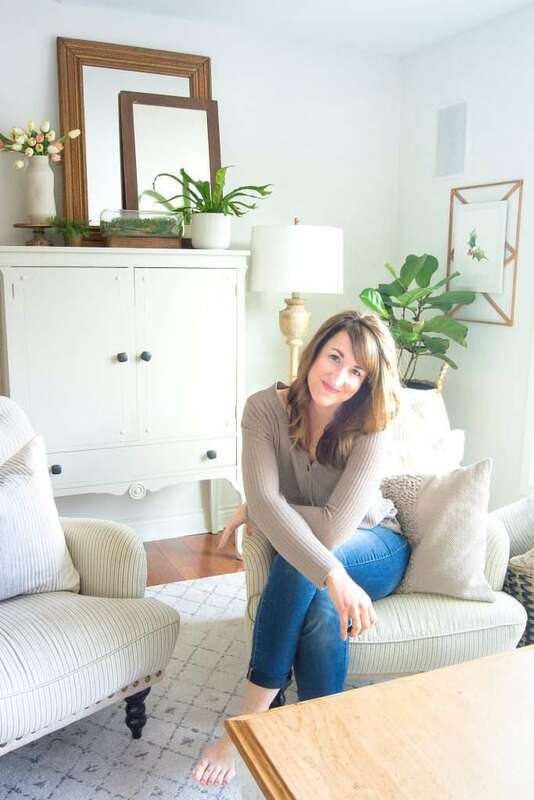 I love this project because it can be as simple as mine is or as elaborate as you want! 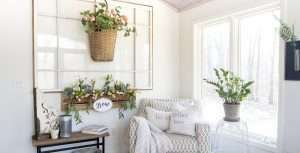 Choose different faux plants, succulents, or floral mats to create a unique faux terrarium suited to your taste. 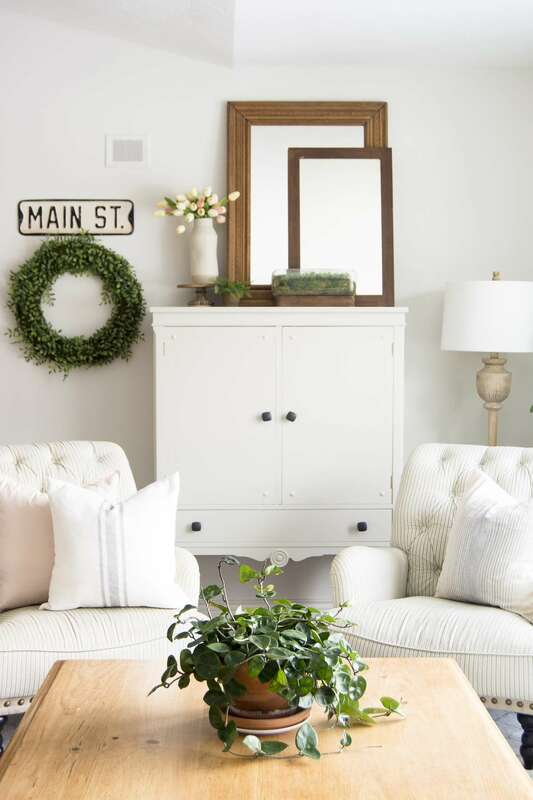 I love how it is a good transition piece to bring my winter decor into spring. 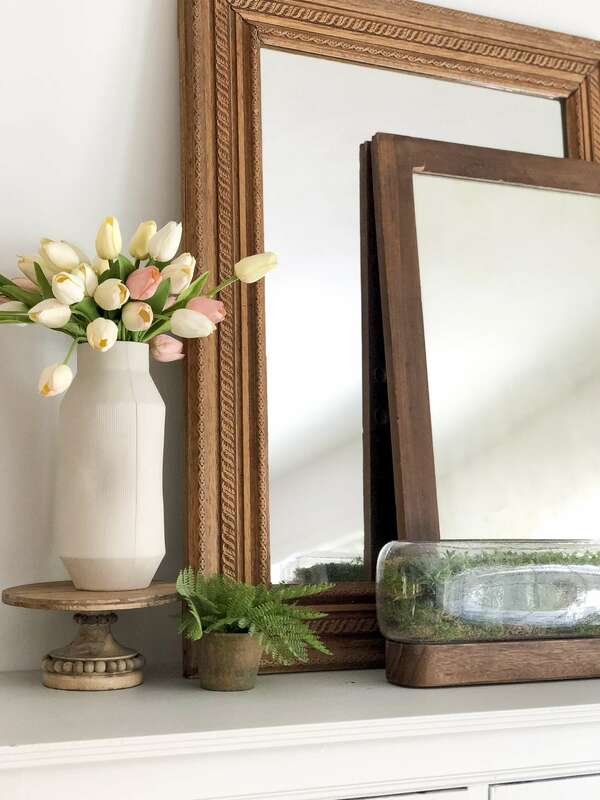 Coupling it with my favorite faux tulips brightens this corner even in the dead of winter! 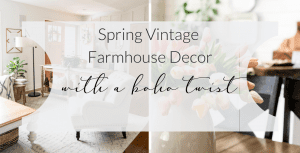 Make sure to also check out my favorite faux florals as we head into spring. 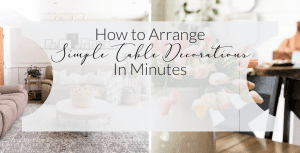 I’ve rounded them all up for you in this post. 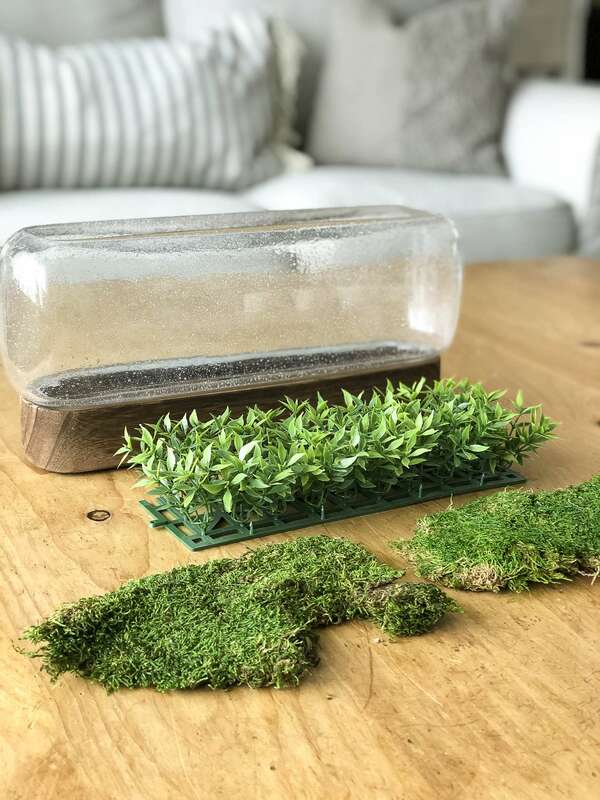 What will you put into your faux terrarium? I’d love to hear your own creative take on this project! If you decide to make one, make sure to tag me on Instagram and show me your creation! 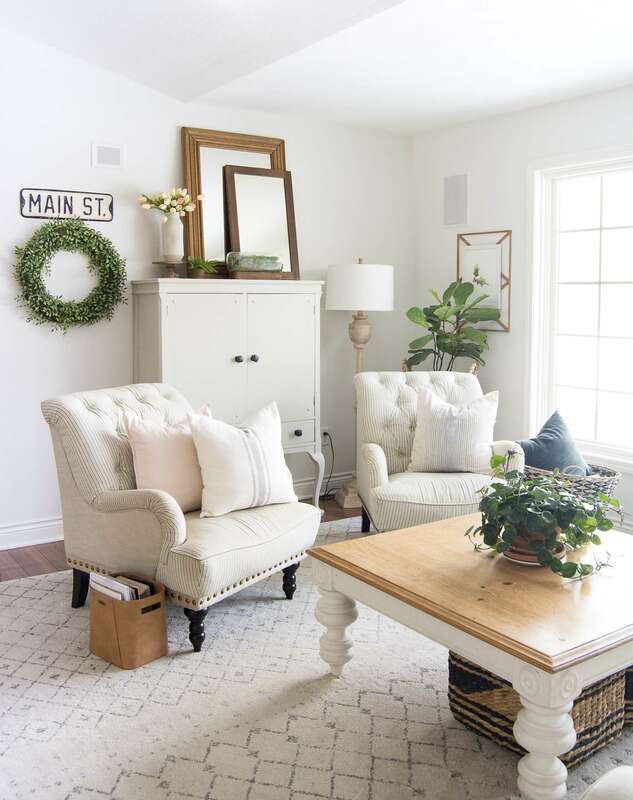 You can shop all the materials needed for this project below. Happy creating! I look forward to making my own terrarium. 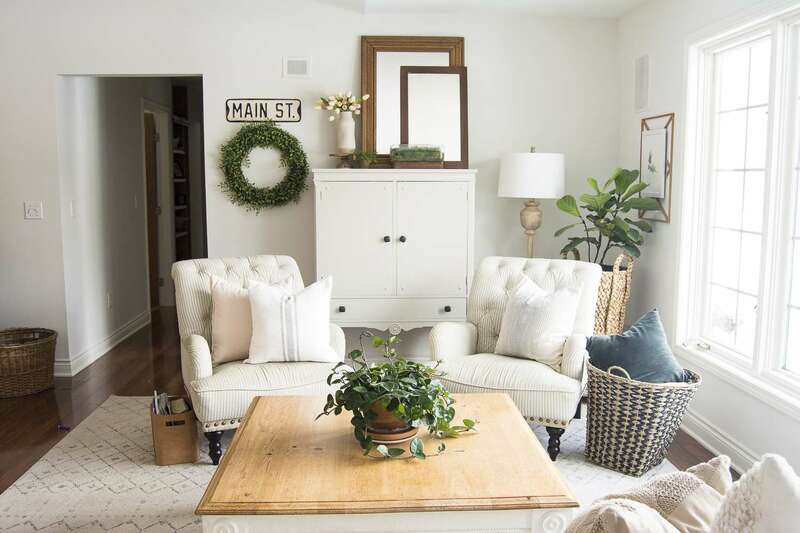 But first, could you tell me the name of the pretty plant on your coffee table? I really like it a lot! Thanks! I’m so glad! The plant is called a Hoya Wax plant.